...But more on that later. Lets take a look at Sake Bar Kushi's decor. I love all the dark wood here, every bit of it. I know some of you may think it's too dark but really, it works, especially with the long straight lines and wide panels. The warm lighting also brightens up the space so it's not dark at all and is in fact, quite cozy. The statement piece in the room is definitely the communal table in the middle which separates the semi-private booths on both sides. The display of sake and beer bottles dividing the table is also attractive and fun. I call this wall "The Great Wall of Kushi"! Following the The Great Wall of Kushi will lead you to Sake Bar Kushi's party room at the back. With three long tables stretched across, the room can comfortably accommodate 30 people. This is really great for birthdays and private parties. 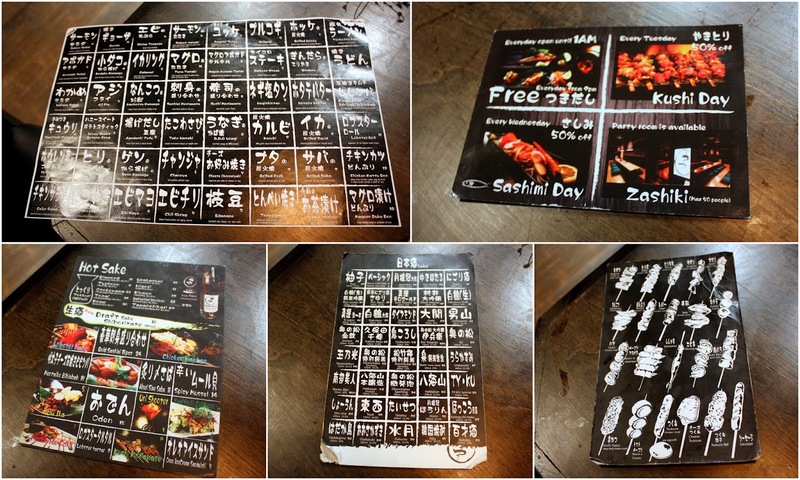 One other menu I'm missing here is Sake Bar Kushi's dinner binder menu which consists of an extensive list of appetizers, nigiri, sashimi, rolls, rice and noodles dishes. On top of all that Sake Bar Kushi also offers a separate prix fixe menu where diners can pick a salad + starter + kushi + entree + dessert for $29. So this is what went down. The kind people at Sake Bar Kushi invited me and a guest for dinner. They would bring out dishes for us throughout the evening, which were complimentary, and whatever we order extra will be on us. Sounds good to me! So at the beginning of the night, my friend Alex (@tsangzillavs) and I held off on ordering because 1) we wanted to gauge how much complimentary food was coming, and 2) we honestly had to see if we even liked the food at Sake Bar Kushi to justify ordering more. When we realized that we could eat more (surprise, surprise) and that were genuinely very happy with the quality of the dishes, we ordered more food. And oh man, did we ever! It is ridiculous how much Alex and I had. You'll see. 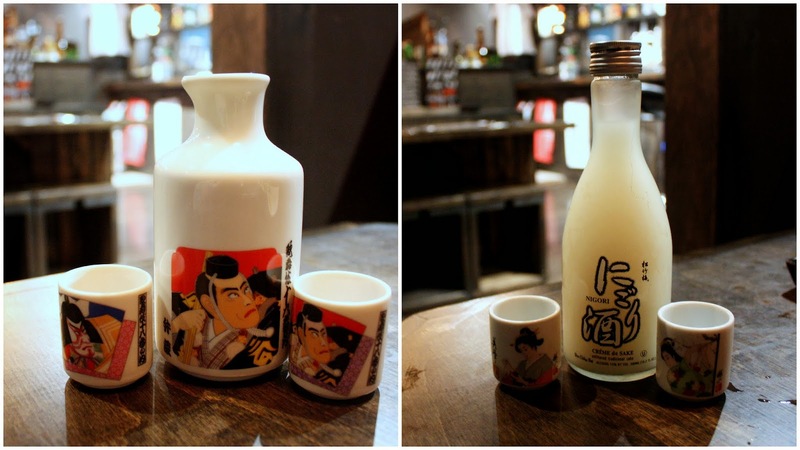 We started the night with some hot, made in-house, draft sake. We were craving hot sake since it was so bloody cold outside. We had the cold nigori (on the right) after we warmed up. Avocado slices on top of mixed greens finished with a light dressing. This was very appetizing - a great start to the evening. Thoroughly dressed then drizzled lightly with mayo, these fried shrimps had a nice crispiness to them. This was the first time I've seen gyoza prepared this way. Underneath the "tent" were four individual dumplings all attached to the large piece of gyoza skin. Other than the pork belly, which was surprisingly tough, the skewers on this plate were all really tasty and grilled just right. My favourite here is the chicken tsukune (tsukune is a generic term referring to any meat or seafood that’s ground up, seasoned and reformed into balls, sticks or patties). The ground chicken had a nice bite to it and the melted cheese on top was on a bonus. The chicken tail was also very juicy and tender. We initially wanted chicken neck and bacon with tomato but both weren't available so we opted for the heart and knee. Both were delicious. It is impossible for me not to order uni shooter when I see it on the menu. I can never seem to turn down a shot of tangy, alcoholic and spicy concoction with fresh uni, raw quail egg and fish eggs. This uni shooter at Sake Bar Kushi, complete with gold flakes, was excellent. Chicken nanban (a type of yoshoku or Japanese-style western food) is an authentic dish from Miyazaki prefecture. It is is made out of lightly seasoned fried chicken doused in a sweet, sour, spicy, mayo-type sauce called nanban sauce....and there's a LOT of it here, so much so I had to scrape some off but other than that, I quite enjoyed this dish (this was my first time having chicken nanban). I didn't know what to do with the side of micro greens - I just placed some on top of every bite of chicken...and that worked well. I really liked the strong, barbecue flavour of the eel. However I wish there was more eel - not in terms of quantity (slices) but rather just thicker slices. These were sliced too thin and small, which I assume explains the low price tag, but I'd rather pay more and feel satisfied with meatier slices. This savoury grilled pancake was off-the-wall gooey and saucy. Topped with dried bonito flakes, this Japanese cheese "pizza" was tasty but also very filling (trust me the feeling creeps up on you). Hidden beneath all that garnish are long slivers of salmon tempura. I don't recall ever having salmon tempura before so this was different but yet it tasted exactly like how I thought it would (i.e. salmon coated with tempura batter then deep fried). Often filled with way more batter than octopus, the takoyaki at Sake Bar Kushi had a good ratio of both. There were generous bites of octopus in each of these takoyaki balls. Although the teriyaki marinade was quite nice the salmon itself was on the dry side. The gyozas (on the far right) served with this entree was a nice touch. Incredibly tasty grilled beef tongue served on a sizzling hot plate. Aside from one piece of overcooked beef tongue, all the others were very tender and perfectly grilled. Alex and I both loved the generous amount of onions, scallions, micro greens and various fixins' that came with the dish. To finish our meal (before dessert that is) we wanted something soup-y and naturally, we gravitated to ramen. This was a good, decent bowl of ramen with a silky, tonkotsu broth and semi-fatty pork. Nothing mind blowing here but it certainly did the trick. This was a good dessert with soft, moist brownie pieces and two scoops ice cream. I like the fruity elements - the cherry, blueberries and strawberries - as well as what looks to be Pocky sticks. Even though the first dessert was good and we were beyond full, Alex and I didn't think that dessert "Japanese" enough - we wanted something more "Japanese-y". And what else screams "Japanese!" in desserts more than MOCHI? A thin layer of soft, gel-like mango-flavored rice cake wrapped around mango ice cream, which in turn sat on top more ice cream. Yummm. Sake Bar Kushi, with its exceptionally large menu and options, gives diners an opportunity to try a lot of different dishes. From small apps to salads, tempura to skewers, sashimi and sushi rolls, all the way to entrees and prix fixes, Sake Bar Kushi has got you covered when it comes to fulfilling your Japanese food cravings. Plates are also neat and nicely presented although they do use a lot of lotus root chips, scallions and microgreens for garnish (not a big deal for me though because I happen to like those things). We had phenomenal service that evening too; our waitress was friendly, attentive, and very polite. If you're wondering about the noise level I assure you that Sake Bar Kushi is no where near as loud as Guu. I was able to have a normal conversation with Alex, who was sitting across the table from me, without having to raise my voice at all (unlike Guu where I have trouble hearing what the person right next to me is saying). Don't get me wrong there is sporadic shouting at Sake Bar Kushi too, achieving that "izakaya vibe" but it's at most one to two people at a time and not everybody at the friggin' restaurant, ya know what I mean?